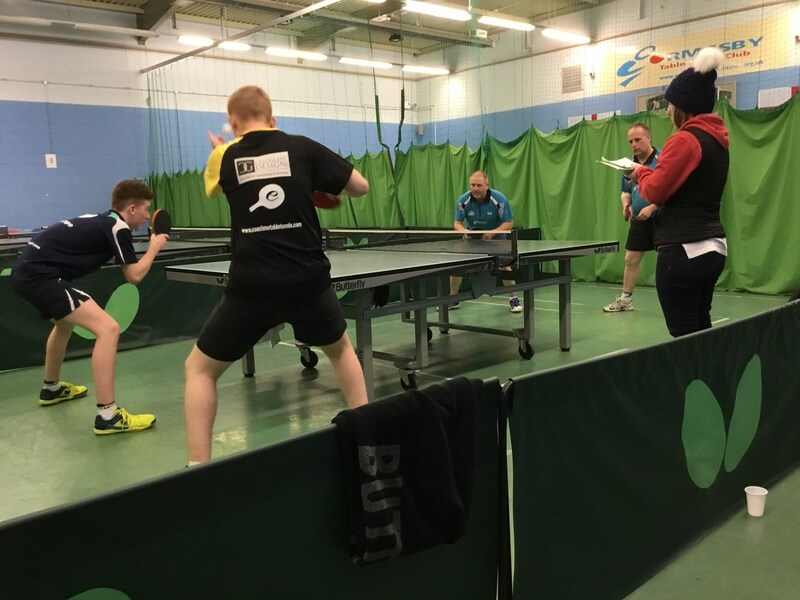 With a 9-1 victory over Beaumont Accountancy Nomads in last week’s fixtures, Swerve C have taken the top spot in the First Division of the Middlesbrough and District Table Tennis League. Andy Wilson and Sam Bailey both scored hat tricks for Swerve C. Martin Rutter won two losing only to Stephen Baines. Victory was as comfortable as the score line suggests, with only the Doubles requiring the fifth game that was won by Rutter and Wilson at 11-7 against Craig Dring and Baines. This result puts Swerve C in the top position in the Division with 48 points. However they have played one fixture more than the two teams in the second and third positions Ormesby A and Beaumont Accountancy Nomads A, and two more than Swerve A who are in the fourth place. Left to right - Joe and Jack Cope (Ormesby A) and David Ashwell and Gary Whyman (Ormesby B). Ormesby A kept on track for with their championship hopes with an 8-2 victory against their own B team. Joe Cope was the star of this match scoring a hat trick. David Gofton and Jack Cope won two each. For Ormesby B Dave Ashwell was outstanding taking Joe Cope to five games after winning the first two and beating Gofton 3-1 and Jack Cope by the same score. Ormesby A are in second place with 47 points but with a match in hand. Swerve A who are in fourth place in the table have two matches in hand. They maintained their interest in the championship race with an 8-2 victory against Nunthorpe A. Alec Ward and Kieran Wardell won three each whilst Nick Corking and Dave Williams won one each for Nunthorpe with victories against Holly Williams. Corkings’ victory over Williams was by the narrowest of margins with the Swerve player winning 2-1 before Corking won the final two games at 11-9. Swerve A remain very much in the frame with 38 points from 5 whilst Beaumont Accountancy Nomads are in third place with 42 from 6. Middlesbrough Table Tennis League is a table tennis league affiliated to Table Tennis England.